PLDT Group's Chairman Manny V. Pangilinan (MVP) officially launced today, September 26, 2014 the FREE mobile Internet services for prepaid subscribers of Smart Communications, Inc. (Smart), Talk ‘N Text and Sun Cellular. From September 26 to November 30, 2014, over 66 million subscribers of the PLDT Group can gain access to the Internet for free using their data-enabled cellphones to browse through and post on their Facebook, Twitter and Instagram accounts, visit their favorites websites, search on Google and Wikipedia, use navigation tools like Waze and Google Maps, book a cab or limo service via Easy Taxi and Uber, or use traffic info sites such as the MMDA's and InterAksyon's. 1. 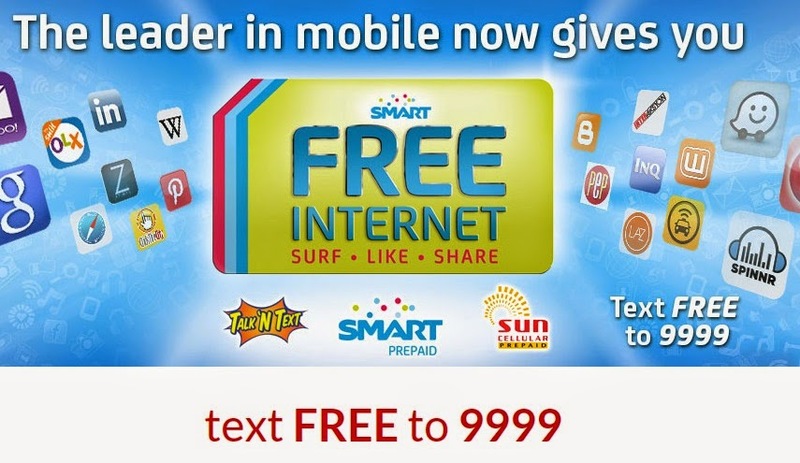 As a special promo/offer, ALL PREPAID subscribers of Smart, TNT and Sun will enjoy FREE MOBILE INTERNET access. 2. FREE INTERNET is a promotion available to all ACTIVE prepaid subscribers to enjoy access to mobile Internet with no extra cost, initially up to 30MB, and subject to the promo terms and fair use policy. An ACTIVE Smart subscriber has an available airtime balance of at least one peso or is subscribed to any load bucket/promo. Note that postpaid and broadband will have their own promotions. 5. All ACTIVE Smart, TNT and Sun subscribers can avail of the free Internet promo anytime within the promo period. To avail of the service, the subscriber must register daily, by sending FREE to 9999. Registration is FREE. The subscriber will then receive an SMS confirmation upon successful registration. 6. If you have existing subscriptions, data package will NOT be affected, and you will still be allowed to register to the Free Internet special offer. While using the Free Internet special offer and you access the sites/apps that are EXCLUDED under the promo terms, these transactions will be charged against your existing data subscription. 7. FREE INTERNET offer is not unlimited. Subscribers can enjoy all-day access to their favorite sites for free, initially up to 30MB. The free service, however, is subject to the promo use conditions. 8. What can you do with 30MB? On the average, a subscriber with 30MB can enjoy ALL of the following services: 20 social media posts with photo, 50 web pages loads, 20 plain emails and 15 minutes of music streaming. 9. Is the Free internet service available for roaming? No. Promo can only be used while in the Philippines. 10. What is the committed speed for the service? Speed will depend on several factors, such as the device/handset being used, the location and the time of use of the subscriber. The service is delivered across all network platforms – 2G/3G/4G. The minimum speed is 12kbps.